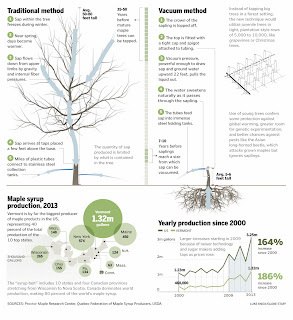 Maximizing Progress: Sweet Science ~ Reinventing Maple Harvesting! "Scientists find way to harvest without taps or buckets or, even, what you’d call trees. Cutting-edge maple syrup production experiments at the University of Vermont show that maple sap can be vacuumed from the slashed-off trunks of saplings."